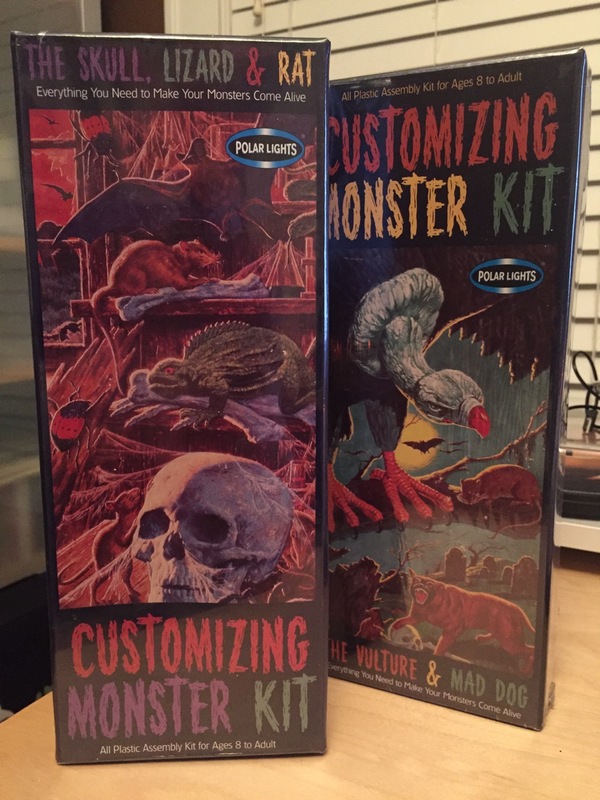 It was a set of perfectly preserved, still sealed Polar Lights' Customizing Monster Kits. "The Skull, Lizard & Rat" and "The Vulture & Mad Dog." Everything You Need to Make Your Monsters Come Alive. I had forgotten that I had ever picked them up! They had been tucked away for the better part of 15 years, and they both still had the original $2.99 price tag from the local discount store. Unreal. These plastic model kits were part of a large assortment originally released during the monster kid craze of the 1960s under the well-known name of Aurora. Polar Lights re-released many of these kits in the late 1990s, keeping the original's famous long-box form and incredibly cool packaging art. These will definitely go on display in my ever-growing collection of monsters and masks! And this score has piqued my interest to see what other long-forgotten monster treasures are buried away in my attic, just waiting to be rediscovered. I'll dig in and post up what I find soon!